UNITED NATIONS, Feb 13 2015 (IPS) - As the Iranian nuclear talks hurtle towards a Mar. 24 deadline, there is renewed debate among activists about the blatant Western double standards underlying the politically-heated issue, and more importantly, the resurrection of a longstanding proposal for a Middle East free from weapons of mass destruction (WMD). And this is the primary motivation for his upcoming and very controversial partisan speech before the U.S. Congress on the eve of the Israeli elections, which has aroused a tremendous amount of opposition in Israel, in the American Jewish community and in the U.S. in general, he pointed out. Iran, which has consistently denied any plans to acquire nuclear weapons, will continue its final round of talks involving Germany and the five permanent members of the U.N. Security Council: the United States, Britain, France, China and Russia (collectively known as P-5, plus one). The New York Times quoted the Washington-based Arms Control Association as saying Israel is believed to have 100 to 200 nuclear warheads. The Israelis, as a longstanding policy, have neither confirmed nor denied the nuclear arsenal. But both the United States and Israel have been dragging their feet over the proposal for a nuclear-free Middle East. Bob Rigg, a former senior editor with the Organisation for the Prohibition of Chemical Weapons (OPCW), told IPS the U.S. government conveniently ignores its own successive National Intelligence Estimates, which represent the consensus views of all 13 or so U.S. intelligence agencies, that there has been no evidence, in the period since 2004, of any Iranian intention to acquire nuclear weapons. “If Israel is the only nuclear possessor in the Middle East, this combined with the U.S nuclear and conventional capability, gives the U.S. and Israel an enormously powerful strategic lever in the region,” Rigg said. He said this is even more realistic, especially now that Syria’s chemical weapons (CW) have been destroyed. They were the only real threat to Israel in the region. “This dimension of the destruction of Syria’s CW has gone strangely unnoticed. Syria had Russian-made missiles that could have targeted population centres right throughout Israel,” said Rigg, a former chair of the New Zealand Consultative Committee on Disarmament. A question being asked by military analysts is: why is Israel, armed with both nuclear weapons and also some of the most sophisticated conventional arms from the United States, fearful of any neighbour with WMDs? Will a possibly nuclear-armed Iran, or for that matter Saudi Arabia or Egypt, risk using nuclear weapons against Israel since it would also exterminate the Palestinians in the Israeli-occupied territories? ask nuclear activists. Of course, he said, the fundamental solution to this danger would be the creation of a Weapons of Mass Destruction Free Zone in the Middle East. That will require a two-track parallel process: One track moving towards a resolution of the Israeli-Palestinian conflict, and the other track moving towards the creation of a regional regime of peace and security, with the aid of the Arab Peace Initiative (API), within which a WMD Free Zone would be a major component, said Schenker, a strong advocate of nuclear disarmament. As for the international conference on a nuclear and WMD free zone before the next NPT (Nuclear Non-Proliferation Treaty) Review Conference, scheduled to begin at the end of April in New York, he said, the proposal is still alive. In mid-March, the Academic Peace Orchestra Middle East initiative will convene a conference in Berlin, whose theme is “Fulfilling the Mandate of the Helsinki Conference in View of the 2015 NPT Review Conference”. It will include a session on the topic featuring Finnish Ambassador Jaakko Laajava, the facilitator of the conference, together with governmental representatives from Israel, Saudi Arabia, Egypt and Germany. There will also be an Iranian participant at the conference, said Schenker. Rigg told IPS Israel’s first Prime Minister Ben Gurion wanted nuclear weapons from the outset. 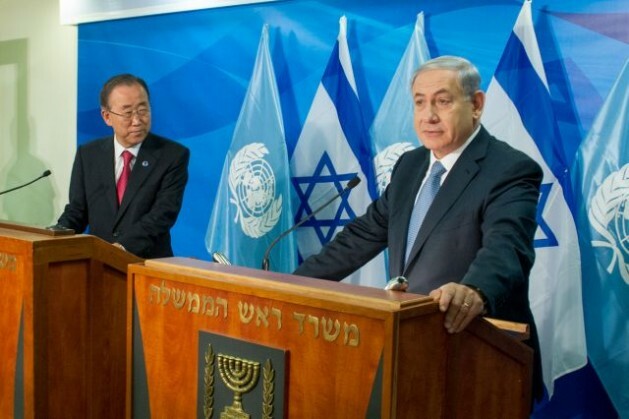 Israel was approved by the new United Nations, which then had only 55 or so members. Most of the developing world was still recovering from World War II and many new states had yet to emerge. He said the United States and the Western powers played the key role in setting up the U.N.
“They wanted an Israel, even though Israeli terrorists murdered Count Folke Berdadotte of Sweden, the U.N. representative who was suspected of being favourable to the Palestinians,” Rigg said. The Palestinians were consulted, and said no, but were ignored, he said. Only two Arab states were then U.N. members. They were also ignored. Most of today’s Muslim states either did not exist or were also ignored. Given the unrelenting hostility of the Arab states to the Western creation of Israel, he said, Israel developed nuclear weapons to give itself a greater sense of security. “If Israel lost its regional monopoly on nuclear weapons, it would be vulnerable. So the U.S. goes all out to block nuclear weapons – except for Israel,” he added. Not even Israel argues that Iran has nuclear weapons now. The U.S. finds excuses to avoid prodding Israel into joining the NPT. The U.S. is effectively for nuclear proliferation in the Middle East, but successive U.S. presidents have refused to publicly say that Israel has nuclear weapons, he added. Because of all this, a NWF zone in the ME is not a real possibility, even if U.S. President Barack Obama and Netanyahu are at each other’s throats, said Rigg. Schenker said Netanyahu’s comments come at a time when the 22-member League of Arab States, backed by the 57-member Organisation of Islamic Cooperation (OIC) have, since 2002, presented Israel an Arab Peace Initiative (API). The API offers peace and normal relations in exchange for the end of the occupation and the establishment of a Palestinian state in the West Bank, Gaza, with East Jerusalem as its capital, and an agreed upon solution to the refugee problem. This doesn’t mean that the danger of nuclear proliferation isn’t a problem in the Middle East, said Schenker. The challenge of a potential Iranian nuclear weapons programme would break that status quo, and create the danger of a regional nuclear arms race, he noted. Unfortunately, the global community is very occupied with the challenge of other crises right now, such as Ukraine and the Islamic State. “So it is to be hoped the necessary political attention will also be focused on the challenges connected to the upcoming NPT Review conference, and the need to make progress on the Middle Eastern WMD Free Zone track as well,” he declared. Israel’s undeclared nuclear program was just confirmed by US government documents. It’s time to disarm Israel before they follow through on threats to unilaterally attack Iran. This is a rogue state armed verifiably with weapons of mass destruction that poses an imminent threat to global security. Their stated intentions, record of indiscriminant killing of civilians and history of hiding an undeclared arsenal make moving to contain and neutralize Israel a world priority. Why is this talking in terms of an Iranian nuclear WEAPONS program? Biggest BS article I have read in a long time!! Israel will be wiped out if Iran gets Nuclear weapons!The Muslims goal in life is to wipe out non believers!! IPS is becoming nothing but a propaganda site! !